Eden had a litter of September 15 2002! Visit the Litters page for more information. Eden is our plain "Wonder Girl". She has a beautiful head with a sweet expression, gorgeous topline and excellent neck to shoulder. 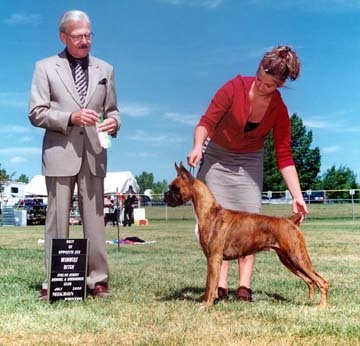 Eden won BOS under R. Lopaschuk at the Saamis Kennel and Obedience Club on May 11, 2001. It was Eden's first weekend as a Champion. Eden quickly finished her Canadian championship with a WB and BOS under Mr. Jack Ireland, a 5 pt. win under Swedish judge, Mr. Kenneth Edh and a 4 pt. win under Larry Kerluke. 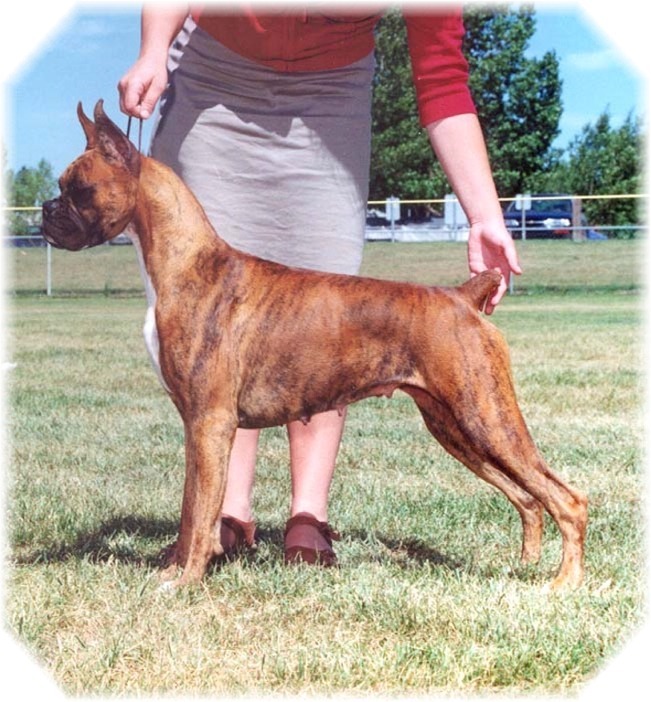 She also placed second in her class, at our Alberta Boxer Specialty, under Dave Strachan. Eden was handled by her friend Karen Oxtoby of Bravo Boxers. Eden is a daughter of Am./Cdn. BIS.BISS.Ch. 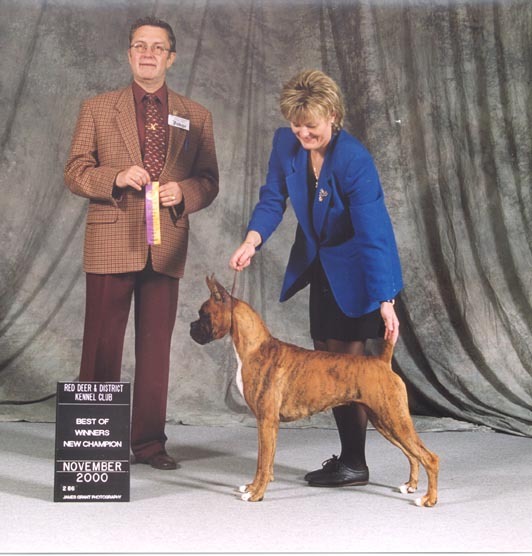 Berlane's Causin' An Uproar A/C CDX the Top Boxer & #4 Working Dog in 1998, and the Top Boxer & #4 ALL BREEDS Dog in 1999! Eden's mother is "Mocha" Ch. Hi Times Pagan Lady Mephisto. "Mocha" is a Am/Cdn./Jap./Int'l Ch. Mephisto's Guns and Roses daughter out of his half sister Ch. Mephistos Deja Vu. Health tests: Pennhipped - 50th percentile (Rt hip .50 Lft hip .46) Heart clearance for SAS, Heart holter monitored (24hrs) at 15 months 0% PVCs, eyes tested normal. Eden was bred to Am. Ch. Ein Vons Dock of the Bay and delivered 5 puppies on September 15. Visit the puppies at their page. We are very excited about this young girl, whom despite being a "plain", obtained her championship very quickly. 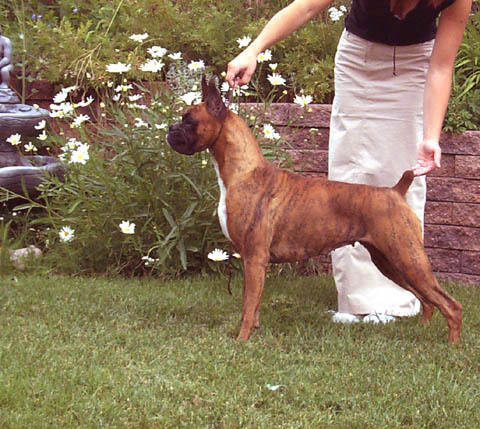 We will continue to show Eden in Specials because we believe it's HITIME that judges start to consider the plain Boxers which will play an important part in our breed. For information on her brother "Trouble" visit his page. For more information on her sister Wicked visit her page.